Does Vitamin A Help Treat Lung Cancer? Lung cancer claims more lives yearly than breast, ovarian, colon, and prostate cancers combined, according to Mayo Clinic. So if you have lung cancer, you may be seeking ways to better your chances of successful treatment and survival. You might have heard about vitamin A as a way to help treat lung cancer, but are wondering if this strategy is worth a try. You've probably heard that eating fruits and veggies packed with vitamins and minerals may help prevent cancer, which is why scientists have studied effects of vitamin A on lung cancer treatment and prevention. In fact, the Office of Dietary Supplements says some observational studies show high fruit and veggie or carotenoid (antioxidants found in some fruits and vegetables that can form vitamin A) intakes are associated with lower lung cancer risks. However, the same source reports clinical trials haven't backed using vitamin A or beta-carotene (a carotenoid) supplements for lung cancer prevention. A 2011 review published in PLOS One says that while vitamin A has been used to treat and prevent lung cancers in the past, evidence doesn't support its use. Can Vitamins Help Treat COPD? Is the Juice Plus Scam Fact or Fiction? The same review published in 2011 in PLOS One analyzed 248 studies that examined effects of different forms of vitamin A on lung cancer. Authors of the review say some studies reported benefits from using vitamin A on lung cancer, but overall there isn't enough evidence to support vitamin A (or forms of vitamin A) as a form of lung cancer treatment or prevention. The Linus Pauling Institute also suggests it's unlikely vitamin A lowers your risk for lung cancer. High doses of vitamin A supplements may be harmful when you have (or are at risk of developing) cancer. One study showed that beta carotene (your body converts beta carotene to vitamin A) supplements combined with retinyl palmitate (a form of vitamin A) supplements increased lung cancer among smokers and asbestos workers by 28 percent after four years' time, the Linus Pauling Institute reports. Likewise, the University of Maryland Medical Center says taking vitamin A or beta carotene supplements is linked with higher lung cancer risks in people who drink alcohol or smoke. 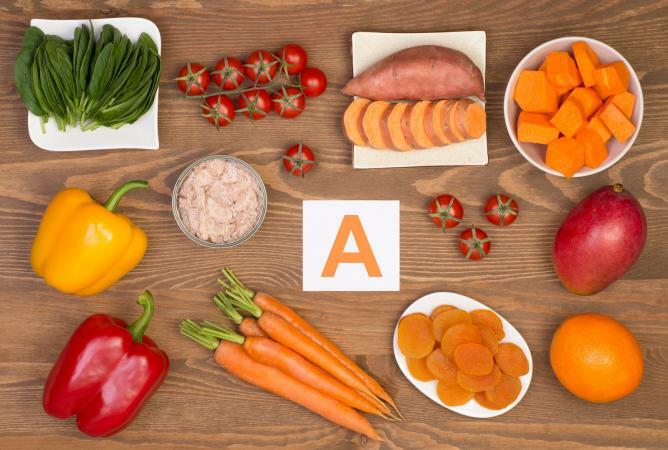 What About Vitamin A in Fruits and Veggies? Vitamin A is abundant in fruits and vegetables, which are foods often associated with lower cancer risks. One 2015 review published in Annals of Oncology found eating more fruits and veggies (up to 400 grams daily) is associated with lower lung cancer risks, but smoking is the strongest determinant of whether you get lung cancer. The authors say there is a chance the results of the 2015 review could be due to smoking (or lack thereof), not fruit and veggie intake but still recommend eating fruits and veggies as a prevention measure. However, the review didn't single out fruits and veggies rich in vitamin A with all other types of vegetables and fruits. How Much Vitamin A Is Enough? As a rule of thumb, if you're at risk for or have lung cancer, avoid taking high doses of vitamin A or beta-carotene supplements. Better yet, avoid taking any type of vitamin A supplement unless your doctor okays it. The recommended dietary allowance (RDA) for vitamin A is 900 micrograms for men, 700 micrograms for women, 770 micrograms during pregnancy, and 1,300 micrograms of vitamin A daily while breastfeeding. You'll likely get all the vitamin A your body needs daily by eating a variety of vitamin A-rich foods. The Dietary Guidelines for Americans 2015 suggest getting in 2 cups of fruits and 2 ½ cups of veggies daily (when eating 2,000 calories per day). Despite what you might have heard, taking vitamin A or beta-carotene supplements as a treatment for lung cancer doesn't appear to be helpful and isn't a good idea (in high doses) based on research findings. However, more research is needed in this area. Your body does need plenty of vitamin A to function properly, so be sure to include a variety of vitamin A-rich foods (especially fruits and veggies) in your diet daily to meet nutritional needs. And perhaps most importantly, if you're a smoker the best way to lower lung cancer risks is to stop smoking.